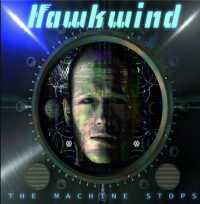 Space rock band Hawkwind have done iconic SF adaptations very well before. While Spirit Of The Age featured exceptionally good usage of sci-fi tropes - including clones, androids, and time dilation - Damnation Alley (another song from their 1977 album, Quark, Strangeness And Charm), was actually superior, appearing in the same year as the screen version of Roger Zelazny's 1969 novel, but proving to be a better adaptation of the book than Jack Smight's Damnation Alley movie. The Machine Stops is based on a classic short story by E.M. Forster, first published in 1909, and adapted for TV as a 1966 episode of the great genre anthology series Out Of The Unknown. Forster's story of a subterranean hive remains one of the core SF tales, and its tremendous conceptual influence was later seen on the big screen in the likes of THX-1138 (1971), and Logan's Run(1976). There was even a comicbook version of TMS in 2014. Ultimately, Forster's prophetic story delivers uncanny truths with acutely social relevance for tomorrow's world, today. This concept album of 14 tracks offers delightfully vintage Hawkwindy sound-scapes to generate a considerably surrealistic feel. Atmospheric intro All Hail The Machine is narrated, rather than sung, but it fits the subject well by drawing us into this scenario of clinical dystopia, home to a colourless generation of humans without personalities. The Machine lays out the band's prog/ psychedelic rock manifesto where every cyber-mediated relationship in isolation leaves a protagonist inmate yearning for sunshine. Dave Brock's instrumental Katie is followed by some indiscernible vocals (forgivable as a basic Hawkwind trait) of mystical musings in King Of The World. The next track, In My Room forms a key part of the album's hypnotic mythos, wherein various anxiety-inducing rumbles might segue into a wholly calming/ relaxing thrum of tech beats, filling a yawning gap between rebellion and resignation. Every day is Thursday in weeks of despair before a breakthrough escape into solid rocker Synchronised Blue, where the escapee learns the ground above is green, not charred black. Dead Fred Reeves' solo performance Hexagone is a tuneful standout, and explains its 'medical myopia' of agoraphobia with evocative lines like "I've never seen the daytime" and "I always fear the homeless." The 'little white lies' about external misery continue to pile-up against the lightning shock diversity of Living On Earth, before Niall Hone's superb solo instrumental The Harmonic Hall - full of sweeping Arabian tones, echoing techno beats, and expansive mood-swings. "Well, I suppose I'd better go back to my room," chortles Dave Brock in his feel-good solo track Yum-Yum, and the resigned mood continues for my instant-favourite song, A Solitary Man. Benefiting enormously from its wonderful background melody, Tube has plenty of choice earworm potential. Lost In Scienceseems, at first, like a sampler and medley, as if the band ran out of ideas and so their project simply peters out, but that's not the case. It trails off... only as if suggesting further journeys with more great discoveries yet to come. The Machine Stops is definitely a fast-grower that wins you over with just a couple or three repeat plays. It's so effective a package of artistic brilliance that you might soon wonder how you ever lived outside of the big machinery.